Riding down to Gunnison in the back of an ambulance Sunday afternoon, all I could think about was Brush Creek, the Epic Pass and last week’s Overheard getting pummeled on Facebook. Okay, not really. I was thinking about how not paying attention while skiing fast on a blue run and catching an edge was pretty dumb and probably pretty expensive. Let me say upfront: The whole experience with the people there to help was extraordinary. The response from the Crested Butte Professional Ski Patrol on the hill, the Crested Butte Fire Protection District’s EMT team at my house and on the ride down, the nurses and doctors at Gunnison Valley Hospital was professional and small-town comfortable. We are lucky to have them all. Thank you. To make a long story short, Diane and I had skied up to watch the start of the AJ and I was heading back to the Queen when I caught that edge and all 198 pounds of me flew through the air before landing on flat “packed powder.” It hurt. But I’ve done it before and after a quick check from ski patrol I skied down. Recovering at home, things got a bit woozy and Diane called the EMTs. I was convinced to get checked out in Gunni and after a CT Scan, it was determined I would get to spend the night—which was better than the helicopter ride to GJ, which was on the table. Anyway, it was back to work Tuesday where the Crested Butte News crew had stepped up and I didn’t have to play much catch-up thanks to them. Thank you. But back to work it is. 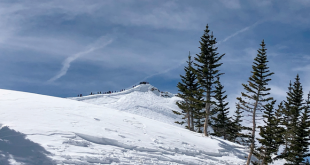 So, with that experience, let me throw out there that at the end of a weird ski season people are riding the razor’s edge—and it is better not to catch the edge. Nothing is quite right with super-thin snowpack and rain in the forecast. It is easy to vent. How dare the ski area partner with Vail’s super pass and not get us free passes to the Back Bowls? How dare the News put something on the front page that might insult some people? How come the town said it was okay to fly a helicopter over Elk Avenue? Why haven’t we had one legit powder day when every time I hear the snow report Monarch is getting four times what we get? Why are Mt. Crested Butte and the Downtown Development Authority paying big bucks for an arts center parking lot when there is no longer even a plan for an arts center? Why is the town starting to smell like dog poop? The end of any ski season always brings such questions from locals. Some are happy to see the end of the skiing and others want three more months of backcountry bliss. But in a low-snow year, everything is taken up a notch. The emotions are a bit more raw, the reactions to anything on the other side a bit more quick. So as we wind up this strange season of a powder drought, it is time for the annual advice to take a breath and put it all in perspective. You get to live in (or visit) one of the special mountain valleys of Colorado. That in itself is pretty wonderful. Being up here at close to 9,000 feet where the air is thin, the sun and the stars shine bright, the sky is that much bluer and the people a tad more rugged than what you might find at the mall, is a gift. There has always been a sometimes turbulent debate on how to guide this particular valley and that won’t go away. But instead of just immediately reacting to every little thing that provokes a tweak, take that extra second in the thin air to think about the big picture. Don’t just throw out negative word bombs about whatever is getting under your skin. That just adds to the dog poop smell in town. Include real perspective and useable solutions. Respect the other side that’s not part of your normal Facebook group. Be honest, forthright and respectful. And then let the chips fall. Being part of the Epic Pass won’t turn this place into Vail. If they had bought the resort, it would be a different story but being a pass partner (and reading this week’s Notions, it probably wasn’t about us) should simply expand what we’ve seen on the weekends the last three seasons with the other super pass partnerships we’ve been a part of. Things in the paper are meant to inform, make people smile or make people think. We don’t aim to be politically correct. Last week’s Overheard—check. The heli over Elk Avenue last week could have been handled better in terms of notice but like so much of life, sometimes things come up unexpectedly and people have to deal and make decisions. The town administration did. In a stereotypical sense, Mt. Crested Butte decisions are typically based in growth so helping to facilitate the Nordic Inn to expand, and growing a new parking lot is not necessarily the right move given the amount of citizen feedback but it’s not that surprising. The lack of powder in Crested Butte might be a sign of things to come as the planet’s climate changes. Last year’s two-week epic powderness could actually be sending the same signal. Luckily we are up here pretty high in the Rocky Mountains so I imagine we have a few more seasons in us than other lower, resorts. 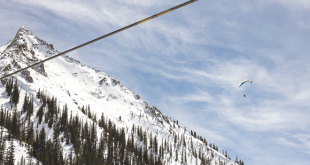 That smell of dog poop in Crested Butte? That’s the annual smell of spring that normally pops out in April. Get used to it…unless Vail buys us and bans dogs that poop. It is a weird perspective to face north while heading south in an ambulance. It is also beautiful. We are in a good place and while not without issues, trials and tribulations, we are pretty darn lucky. I know I am. I’m also sore. 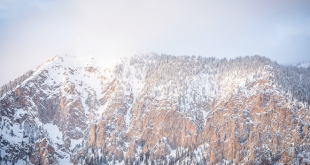 Enjoy the week of the spring equinox and embrace these days as they get longer up here at 9,000 feet. And above all else—don’t stop paying attention.